Trump loves turkey, because that's where Saudi Arabia does its best killing. Guests: Comics Will Durst, Joe DeRosa, Jackie “The Joke Man” Martling and Dave Sirus. Plus Founder and Treasurer of The Blue America PAC, Howie Klein. And Congressman Ted Lieu’s Chief of Staff Marc Cevasco teaches civics. 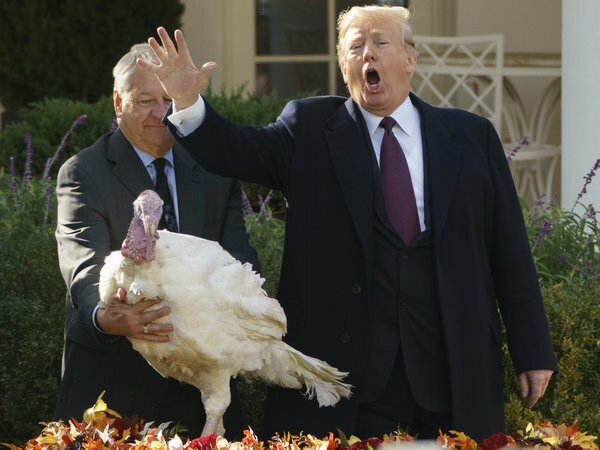 Do you think Trump’s crazy uncle has to train all year for Thanksgiving? Out of respect for Saudi Arabia, Trump’s Turkey gets carved with a bone saw. You know who I really feel sorry for during this Romaine lettuce scare? Chris Christie. What’s he going to eat? Besides everything else. Tomorrow is America’s biggest travel day of the year. It would have been two weeks ago but the Dems got the house. White House Correspondents’ Dinner goes with Ron Chernow because they need an historian to tell them what the First Amendment was. Why is Wombat poop cubed? 6ix9ine arrested on racketeering and firearms charges, but N.R.A. lobbyists remains free. Bitcoin goes from crypto to crippled. Baby Stormi’s first words were supposed to be “Kylie Cosmetics” but they ended up being, “Call child protective services!” For Thanksgiving HOWIE KLEIN visits Turkey instead of eating it. Florida & Georgia elections violate equal protection guaranteed by 14th amendment. Voter suppression is real, time for Dems to rip it wide open or get out of the party. Nelson and Abrams are tools for conceding. Go make money in the private sector you two and perpetuate the rot. David Feldman on Democrats giving up. November 20, 2018.